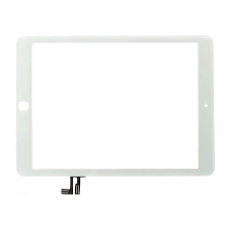 Buy an iPad Air digitiser touch screen replacement in white. If you have broken or cracked your iPad Air glass screen and the LCD display shows an undamaged image, you only need to replace the glass touch screen digtiser. This screen is suitable for the iPad Air 5th generation. * Apple Part Number: 821-1894. This is not a simple repair for someone who has no technical skills with disassembling the Apple iPad Air as the metal rear case is easily damaged when removing the old broken screen.